PORTLAND — It is fitting that our last meal in Portland was our best meal in Portland. Honestly I hadn’t expected such an exceptional meal as the one served at Le Pigeon but it was without question a truly great one. To start, the night began really well. 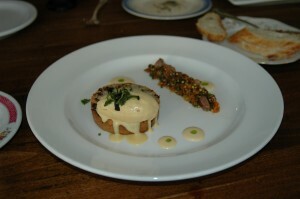 The restaurant is cozy and like many Portland spots the kitchen was centrally located and open. We could have sat at a bar overlooking the chef prep area. Instead we shared a larger table that could have seated eight. However, unlike at Beast, the meal wasn’t served family style and when we arrived the young couple, who appeared to be in the early stages of dating, seated at the end of our table were already eating. What really made the evening an exceptional experience was that our friends generously brought an exquisite bordeaux for us to share. It was so much fun watching the waiter gingerly extract the cork and then gently pour the glasses. What a treat to get to inhale that first scent of the 1964 Chateau Montrose. We toasted each other and our adventures in Portland with a wine older than all of us and reveled in the way the wine changed as we sipped it. So after that unusual experience, my companions voted to put themselves in the hands of the chef. However, after eating nonstop for five days, I have to confess I could only limp along with them — eating three courses to the seven course tasting menu ($85) they happily consumed. I began with a simply perfect watercress and arugula salad tossed with freshly picked pickled strawberries, crunchy pistachios all served atop a layer of creamy fromage blanc. 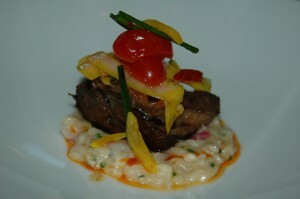 Le Pigeon’s lamb with green garlic risotto, peppers and fennel. My companions began with the geoduck —pronounced gooeyduck, which is a very, very long-necked clam for lack of a better description — served with yuzu, shiso, white soy and diced portabello mushroom. For the next course, they had a beautiful smoked rabbit pie that came atop a piece of toasted bread and actually had hot mustard ice cream— that’s right mustard, like you spread on sandwiches as an ice cream—and that came with cheddar and apricot. Alongside this wonder was a rabbit heart salad with vegetables. This was followed by a delicate grilled lamb tongue, which came with asparagus, egg and Calabrian jam. Throughout the meal there were things that my dining companions said they wouldn’t have ordered if given a choice; however, each was consistently surprised at how wonderful the dishes turned out to be. The tender lamb meat fell into this category. Laura identified this as her favorite dish. We all enjoyed the lobster stuff chicken that was served atop a panzanella salad with fresh peas and a bit of frise. This was all flavored with a delicious lobster and morel sauce and to add to the decadence three tender morels that had been steeped in sauce. As their next course, my companions ate the lamb yellow peppers and fennel served atop a beautiful green garlic risotto. 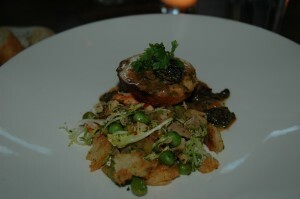 Lobster stuffed chicken with panzanella, lobster and morel cream. The next course was Steve’s stilton cheese, which was a raw Welsh milk cheese, that was served with house-made chicharron also known as pork rinds. Drizzled on the plate was a rhubarb maple syrup accompanied by a compressed suveed rhubarb. Meanwhile, I had the loveliest, lightest St. Germain Angel Food Cake that came with strawberry cremé, wild strawberry sorbet and this wonderful freeze-dried strawberry crumble that was scattered around the plate. I was impressed by the beautiful presentation and the fact that the crumbled strawberry added a wonderful crunch to the dish as well as allowed the kitchen to use excess strawberries from last year’s harvest. My companions ate the same dessert but also enjoyed another exceptionally inventive one. They ate foi gras profiteroles that came with caramel sauce and crunchy sea salt. While we all enjoyed our desserts, our friend Greg was sad not to receive his absolute favorite dish — the crème brulée expresso pot de crème with a shortbread cookie. He spent some time staring longingly at the dessert which was served down the table. So perhaps if you go, you can order that dessert, which looked spectacular. The end of our meal marked the end of our Portland culinary adventure and what an adventure it was. I think you meant the rhubarb was sous vide+Frisee+Foie gras profiteroles. Your dinner sounds wonderful. I can’t wait to try Le Pigeon!